The Hamas victory over Fatah in Gaza on June 14 has great importance for Palestinians, for the Islamist movement, and for the United States. It has rather less significance for Israel. The anarchy that began in early 2004 spewed forth Palestinian clan chieftains and criminal warlords. 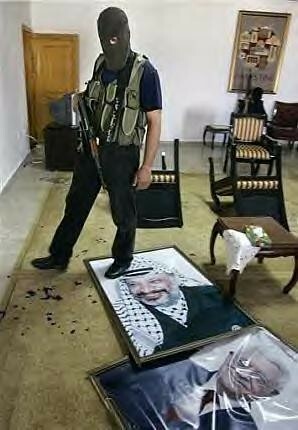 Yasir Arafat's death in November 2004 removed the transcendentally evil figure who alone could bridge the two regions. Israel's withdrawal from Gaza in mid-2005 deprived Gaza of its one stabilizing element. Hamas's victory in the PA elections of January 2006 provided a strong base from which to challenge Fatah. A Hamas gunman expresses his views of Yasir Arafat and Mahmoud Abbas. Assuming Fatah remains in charge on the West Bank (where it is arresting 1,500 Hamas operatives), two rival factions have replaced the single Palestinian Authority. Given the expedient nature of Palestinian nationalism and its recent origins (it dates specifically to 1920), this bifurcation has potentially great import. As I have noted, Palestinianism being so superficial, it could "come to an end, perhaps as quickly as it got started." Alternate affiliations include pan-Islam, pan-Arab nationalism, Egypt, Jordan, or their own tribes and clans. Internationally, Fatah and Hamas engaging in war crimes against each other punctures a supreme myth of modern politics – Palestinian victimization. Further, as two "Palestines" squabble over control of, say, the United Nations seat granted in 1974 to the Palestine Liberation Organization, they damage a second myth – of a Palestinian state. "The Palestinians have come close to putting, by themselves, the last nail in the coffin of the Palestinian cause," observes the foreign minister Saudi Arabia, Saud al-Faisal. A Palestinian journalist notes sarcastically, "The two-state solution has finally worked." In contrast, the Islamist movement gains. Establishing a bulwark in the Gaza Strip gives it a beachhead at the heart of the Middle East from which to infiltrate Egypt, Israel, and the West Bank. The Hamas triumph also offers a psychological boost for Islamists globally. By the same token, it represents a signal Western defeat in the "war on terror," brutally exposing Israeli prime minister Ariel Sharon's short-sighted, feckless unilateral-withdrawal policy from Gaza as well as the Bush administration's heedless rush to elections. 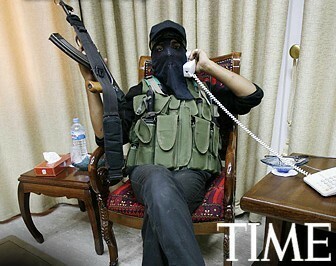 A Hamas gunman relaxes in a Fatah facility. As for Israel, it faces the same existential threat as before. It gains from Hamas's near isolation from the West, from the fractured Palestinian movement, and from its having a single address in Gaza. Also, it benefits from having an enemy, Hamas, overt in its intention to eliminate the Jewish state, rather than dissimulating, like Fatah. (Fatah talks to Jerusalem while killing Israelis, Hamas kills Israelis without negotiations; Fatah is not moderate, but crafty; Hamas is quite purely ideological.) But Israel loses when the fervor, discipline, and stern consistency of totalitarian Islam replace Fatah's incoherent, Arafatian mish-mash. 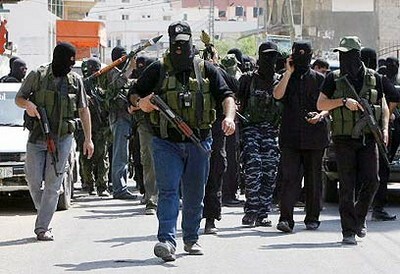 The Fatah-Hamas differences concern personnel, approaches, and tactics. They share allies and goals. 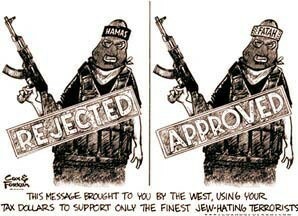 Tehran arms both Hamas and Fatah. The "moderate" terrorists of Fatah and the bad terrorists of Hamas equally inculcate children with a barbaric creed of "martyrdom." Both agree on eliminating the Jewish state. Neither shows a map with Israel present, or even Tel Aviv. Fatah's willingness to play a fraudulent diplomatic game has lured woolly-minded and gullible Westerners, including Israelis, to invest in it. The most recent folly was Washington's decision to listen to its security coordinator in the region, Lieutenant General Keith Dayton, and send Fatah $59 million in military aid to fight Hamas – a policy that proved even more bone-headed when Hamas promptly seized those shipments for its own use. One of these days, maybe, the idiot-savant "peace processors" will note the trail of disasters their handiwork has achieved. Instead of mulishly working to return Fatah and Jerusalem to the bargaining table, they might try focusing on gaining a change of heart among the roughly 80 percent of Palestinians, those still seeking to undo the outcome of the 1948-49 war by defeating Zionism and constructing a 22nd Arab state atop Israel's carcass. Ehud Barak, Israel's brand-new defense minister, reportedly plans to attack Hamas within weeks; but if Jerusalem continues to buoy a corrupt and irredentist Fatah (which Prime Minister Ehud Olmert has just called his "partner"), it only increases the possibility that Hamastan eventually will incorporate the West Bank. June 19, 2007 update: Today's article builds on prior research I have done, notably the blog at "Two Palestines?" which will also update this topic. The danger ... is that in the West Bank - as in the Gaza Strip - infusing massive sums of money from the outside will not facilitate change or rejuvenation, but rather will ensconce the rotting patronage system in its current form. The money will quickly be absorbed into privileged pockets, without ever being used to change the lay of the land. Since its inception, the Palestinian Authority has swallowed enormous sums, without ever creating a productive economic system and effective internal security forces. The PA won't have any problem repeating this exercise time after time. That's what will happen if clear conditions and defined goals aren't set out from the beginning. The West Bank returned to summer time on August 30, when the holiday ended. Gaza ... did not. Compounding the confusion, banks and universities in Gaza affiliated with the Palestinian Authority are keeping West Bank hours. "When my wife calls me, she asks whether I want to have lunch Gaza-time or West Bank-time," a Gaza banker said. "It is ridiculous." Related Topics: Arab-Israel conflict & diplomacy, Palestinians, Radical Islam | Daniel Pipes receive the latest by email: subscribe to the free mef mailing list This text may be reposted or forwarded so long as it is presented as an integral whole with complete and accurate information provided about its author, date, place of publication, and original URL.